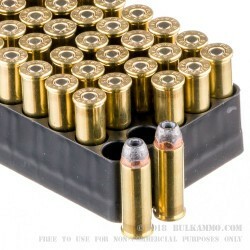 Load up your cylinder or magazine tube with these .44 Magnum rounds from Remington and you'll have the perfect tool for home defense, feral hog control, or light deer hunting! 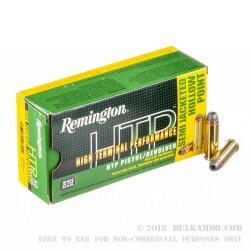 As part of the High Terminal Performance line, these cartridges are built using top grade components which include non-corrosive Boxer primers, reloadable brass casings, and dependable propellants. 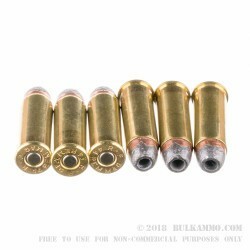 Each round fires a semi-jacketed hollow-point (SJHP) bullet which is designed for impact expansion without jacket separation; this results in deep penetration and the appropriate delivery of energy to vital zones. 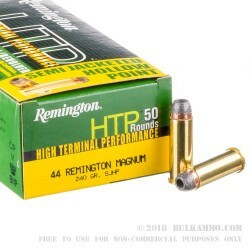 The SJHP projectiles weigh in at 240 grains each which is light for the .44 Remington Magnum caliber and offers devastating velocity. Shooters can expect a reduced amount of lead fouling and longer lasting accuracy due a low positioned copper jacket which covers the base of the bullet. In addition, the bullet's curved shape and flat nose make it safe for use in lever-action rifles. Remington's ammunition is backed by over two centuries of experience and is recognized for its effective performance and affordable prices.